This will be my last blog post as Hillsdale United Methodist Church Public Theology Advocate. I am moving to New England, but the team lives on. We will continue to meet the 2nd Sunday of every month, 11:30am, after worship service. Our meetings are open to all and will start with a reading of sacred text (any text) that speaks to your heart about justice and service. After a brief discussion about the text, we will discuss projects, ideas, and support each other through our personal networks – connecting into justice work that is in progress and groups seeking to do more. In time, other Public Theology Advocates may pick up this blog and continue the quest to share with you, through this medium, the events and work of social justice advocates near and far. If not, that is also fine, because there is a wealth of material in the existing posts. Please look to the homepage of www.HillsdaleNJumc.org for announcements and invitations to join in local justice work. So much is being written, tweeted, shouted, and blasted about refugees and terrorism. The anger and the fear and the absolute disrespect for our fellow humans breaks my heart. I have nothing more to add to the noise. I simply wish to remind my church family of the United Methodist Social Principles we all claim to uphold. And I ask, are we disciples? If we are, then the answer is simple - love God with all our hearts, trust in God and do not fear, and love those who need our love the most: the tired, the sick, the poor, the refugee, and our enemies. Love them ALL as we have been taught to love, by our lord Jesus Christ. We are about to enter the Advent season, and as we recall the tale of a very young couple seeking shelter as they travel far from their home, remember Herod's fear and his actions and the countless families shattered by hatred and fear. Remember the baby born who changed the world. You may have noticed that my weekly blog posts have dwindled down to a few posts a month. This is because there has been much action and much reflection as our team begins to grow, and as we start to reflect on the accomplishments of our first year, 2015, and prepare for 2016. I created this blog, hoping to engage you through understanding the difference between acts of mercy and action for justice, and by sharing with you what I’ve learned along the way. I attended the Greater NJ UMC Annual Conference, and advocated for legislation to welcome LGBT persons into our church as fully accepted members. 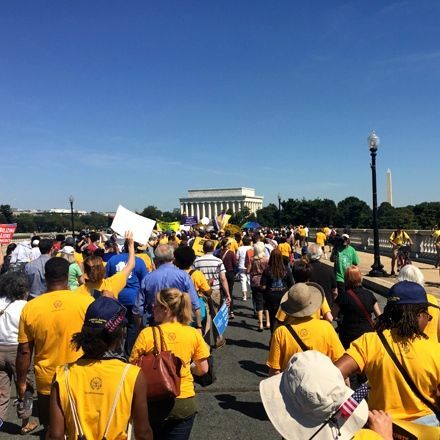 I marched in GA with the NAACP “America’s Journey for Justice”, and a month later, my husband joined me in advocating in DC for legislation to address injustices in education, voting rights, economics, the environment and the criminal justice system. While in DC, we met with the UMC General Board of Church & Society, bringing a personal connection to this amazing resource and receiving their support in our ministry. I attended the NJ Anti-Poverty Network Summit and engaged with many local groups working on a series of interrelated justice issues. I attended meetings of the newly formed Congregations for a Better Bergen in seeking a local inter-faith connection for our team. This group was formed to engage with Metro-IAF projects. We will stay connected with this group, but will not formally engage with them at this time because we are still forming our process and approach locally. New members joined our team, while others have expressed an interest to help with specific justice issues in the future. It has been an energized start for this ministry. And the connections and research continues. I’ve set a stretch goal for the Public Theology Advocates ministry: to engage 10% (a tithe) of the people who regularly attend Sunday worship at Hillsdale UMC. That would mean 12 people from our local church would be actively engaged in, and supporting a project or more, during 2016. The plan is to have a team of leaders – addressing local justice issues with our community, and supporting each other. We realize that the issues are interconnected. The challenge is to have a cohesive ministry working together, and not to fall into the trap of single-mindedness. We will be receiving some training in the fundamentals of community organizing from the UMC General Board of Church & Society. We will connect deeper with local groups currently working on justice issues in our area. Will you join us? What local justice issues worry you the most? Please respond to this blog or contact me directly through Hillsdale United Methodist Church. “God sends us the resources we need … often in the form of people.” That is a statement made at a recent meeting of clergy and lay leaders that I attended in Paterson NJ. These wise words have stayed with me everyday since I first heard them, and they have proven true in so many ways. Two people have joined our Public Theology Advocate team and they are energized to get started – to work for Justice in our communities – to address our local drug problems, economic issues, structural & institutional racism, education injustices, and environmental concerns. These two women inspire me with their honest and open stories, and with their willingness to take a “leap of faith” and design a program of projects that will make a difference. We have a lot of work to accomplish in the coming months as we prepare to launch action plans in 2016. We have three community events already sketched out. These events will be informative and thought-provoking – and we hope inspiring more to join in action. In addition, we are working with clergy and laity through the area as members of Congregations for a Better Bergen and Passaic. CBB and CBP are new groups in the throws of the storming/forming stage of team development – a process that will result in a shared vision and shared goals, positioning us to take action in a meaningful way. We are also working with the United Methodist Church General Board of Church & Society who have offered training and support for our local church as well as Congregations for a Better Bergen and Passaic. And we are seeking to learn and engage with a variety of Justice advocacy groups across the state of NJ and within other faith-based organizations, such as the Lutheran and Catholic churches. Through attending the Anti-Poverty Network of NJ, we have formed connections with a variety of advocacy groups that can help us make a difference as we, in turn, help them in their actions. 5. Act as a liaison between the local church and the Conference Board of Church & Society. In the coming months, as our action plans solidify, we will be asking for more volunteers to join our team. Until then, please continue to pray for us in the role of Public Theology Advocate as we take a stand for justice. Respond to this blog, or contact me directly, with your thoughts, ideas, and concerns about social justice in the Pascack Valley region. It's been a very busy summer, and today the weather is cooler and the sky a little grayer, as we move forward into the final quarter of 2015. I have been writing and blogging and marching and learning and witnessing and singing ... and so have you. And I think today may be a good time to take a moment to pause and reflect on why we have been so busy working for Justice. We work because we are compelled by our faith. Isaiah 1:17 ESV "Learn to do good; seek justice, correct oppression; bring justice to the fatherless, plead the widow's cause." We work because God calls us. Micah 6:8 ESV "what does the Lord require of you but to do justice, and to love kindness, and to walk humbly with your God?" We work because we know that the Christ is in all persons. Matthew 25:35-36 ESV "For I was hungry and you gave me food, I was thirsty and you gave me drink, I was a stranger and you welcomed me, I was naked and you clothed me, I was sick and you visited me, I was in prison and you came to me." And now, let us rest for a moment so that we may face the next challenges with renewed energy! Ecclesiastes 4:6 ESV "Better is a handful of quietness than two hands full of toil and a striving after wind." This week, my husband and I went to Washington DC to rejoin America's Journey for Justice in it's final mile. We marched, attended the rallies, attended the teach-in and beautiful interfaith service, and we advocated on Capital Hill for continued support of important justice issues that effect Bergen County, NJ, USA and the world. Here are a few photos from the week, with comments. 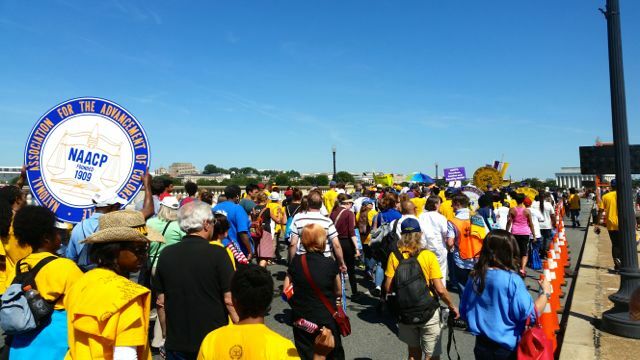 This is a photo of us marching across the Arlington Memorial Bridge towards the Lincoln Memorial. That is me, in the tan hat with the American flag tucked in. 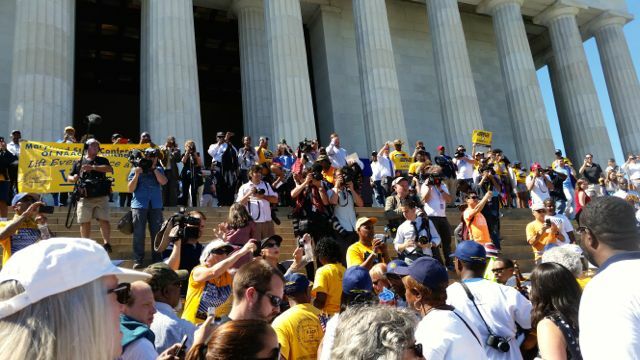 We were 500-600 strong as we marched - people of all walks of life and beliefs - all marching together in support of an end to racial profiling as part of a reformed criminal justice system, restored and improved voter's rights, economic justice including a living wage and equal pay, education for all, and environmental justice. The Torah that was carried from Selma AL to Washington DC is the Word of God marching with us. To hold the Torah, whether you hold it on your left shoulder or the right shoulder, it rests on your heart. The Word of God was in our hearts this day and throughout the 40+ days of the march - reflecting back to Moses, Elijah, and Jesus. As we approached the steps of the Lincoln Memorial we saw Senator Bernie Sanders holding our banner and marching with us. This very public support of a presidential candidate brought much needed press coverage. The news coverage these past 40 days has been limited to local venues, which is a shame on the industry. This march was peaceful and opened many minds and hearts to how injustice effects all of us - black, white, any color and any creed or non-faith, Republican, Democrat, Independent, rich, poor, middle class, young, old - all Americans. After the march, my husband and I visited Arlington Cemetery to pay our respects to those who sacrificed more than their lives so that we may be free. Tuesday evening, September 15th, after the marching has ended, we celebrated an interfaith service at the Washington Hebrew Congregation temple. Pastors, Rabbis, Imans, and Speakers each read scripture, sang songs, and shared their prayers for a just future. NAACP President and CEO Cornell William Brooks gave a powerful sermon that touched all of our hearts and inspired us for the next day's advocacy. 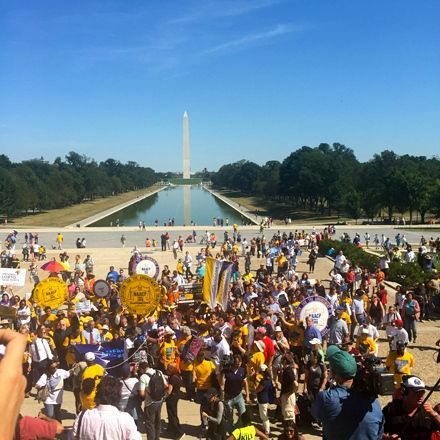 Wednesday, September 16th, we met at Senate Park for a rally before entering Capital Hill and meeting with our legislative representatives in government to advocate for justice on the issues of voting rights, education, fair living wages, and criminal justice reform. Our first stop after the rally was to the United Methodist Building, which is located next to the Supreme Court building. UMC hosted the NAACP team with a conference room where we could pick up copies of legislation and return our summaries of our advocacy meetings. We were impressed with the humble offices of the United Methodist Church offices on Capital Hill. We visited with members of the General Board of Church and Society, who guide us as Public Theology Advocates - and we were warmly greeted. A lasting connection was made. Joined by two advocates from the Temple Emanu-El of West Essex, Cantor Josh Finkel and Susan Cosden - we met with Senator Bob Menendez staff counsel, Andrew Geibel. Andrew was an enthusiastic supporter of the legislation we proposed, listened actively to our stories and concerns, and shared stories of his own. It was a great meeting to start our time on Capital Hill. For the record, Sen. Menendez has a 98% positive voting record on these issues. Our next meeting was with Rep. Scott Garrett's legislative assistant, Nick Iacovella. After such a warm and interactive meeting with Sen. Menendez's staff, we were disappointed by the lack of understanding of how these issues matter to us in Bergen County. I will be writing to Rep. Garrett to seek a second meeting with him, in person, to advocate further and seek his support. For the record, he has a 20% positive voting record for these issues, so we have some work to do to help him understand why these issues matter to us who live in his district. Our final meeting on Capital Hill was with Sen. Cory Booker's senior counsel, Roscoe Jones, Jr. Our fellow advocates from Livingston were very happy to meet him because Sen. Booker has a strong relationship with their synagogue. Unfortunately, we from Hillsdale UMC were not that happy with the lack of interest in hearing how these issues relate to our neighborhoods. Yes, Sen. Booker is a co-sponsor on some of the important legislative proposals, and is an advocate for criminal system reform, but when we spoke of how Sen. Booker can help us effect change in our area, we were cut off mid-sentence and told to reach out to the NJ office in Newark. We were told the work was divided - in DC for federal legislation, and in NJ for NJ-specific legislation. I said, "but Sen. Booker works for NJ and that this federal legislation effects NJ," but we were then dismissed with a repeat of we needed to see the Newark office to discuss these issues. Yes - we will be requesting a follow-up meeting with Sen. Booker himself to advocate for our area. For the record, Sen. Booker does have a positive voting record for these issues, but the data is incomplete in the NAACP scorecard because he joined the senate in October 2013. Our work is not done. This is not the end but a beginning of the next phase of advocacy for justice. We will be working with the Congregations for a Better Bergen to conduct a local listening campaign and create an action plan to address the justice issues that are most deeply effecting our area - including voting rights, education reform, environmental concerns, criminal justice reform, and an end to economical disparity - but we will also be looking for answers to our growing heroin problem and the alarming increase in suicides and the stigma left on the families. We've much much work to do - and we will continue to reach back to the General Board of Church & Society and to our Senators and Congresspersons for their support and assistance.